I’ve been watching no more or less anime than usual; however I’ve had to dump two series part way through viewing them. One was a dodgy bootleg I bought a while back that sputtered multiple times through the first disc until I gave up and trashed it, and the second series I started watching before I realised that I hadn’t actually got the final disc. Oh well. Despite Bandai Entertainment kicking the bucket in terms of home video distribution, luckily they managed to get the last part of the original Gundam series out. When I received it, I put the rest of the backlog aside to watch it. For those who don’t know, the original 1979 TV series is set in the Universal Century year of 0079 (calculated to be about a hundred or so years in the future by some fans). Humanity has ventured out into space and lives in nearly a dozen or so large colonies in Lagrange point orbits around the Earth and the moon. One of these colonies, the Principality of Zeon, declares independence from the Earth Federation and a war ensues. At the eight month point of the war, half of humanity has perished and a number of space colonies have been destroyed, with some deliberately being dropped on cities on Earth. The Federation has sent their new warship, White Base, to the colony Side 7 to acquire a newly developed weapon being built there; the RX-78 Gundam, a newly developed “mobile suit”, or in layman’s terms, a giant robot. Side 7 is the process of being evacuated when a Zeon reconnaissance team of three Zaku mobile suits enter the colony. One of the team members disobeys his commanding officer and shots at unmanned Gundam being transported inside the colony. This starts off a fire fight and teenage boy Amuro Ray accidently acquires the Gundam’s manual (knowing that the robot was his father’s project) and on the spur of the moment decides to fight the Zakus, and wins. 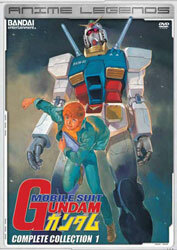 The White Base’s temporary captain, lieutenant Bright Noa, is forced to take on Amuro as the Gundam’s pilot and several of the other teens evacuated from Side 7 as pilots of the other mobile suits and staff aboard the ship, as the majority of the military crew is either dead or severely injured. Along with other civilian evacuees from Side 7 (mostly the very young or the elderly), the ship attempts to make it back to Earth and the federation’s secret base in Jaburo, South America. However it becomes increasing clear that the Federation has no intention of relieving the makeshift crew of its duties. Instead it uses the White Base as a testing ground for experimental mobile suits and weapons and often uses the ship as a decoy. All the while, the crew have to weather continual attacks from various Zeon forces including forces lead by the charismatic and mysterious Char Aznable. While the White Base’s successes are initially attributed to the ship’s technological superiority, it later becomes apparent that several of its teenage crew are in fact “Newtypes”, a new evolution in the human race which has a type of extrasensory powers. I think I first saw the first compilation movie of this series in 1997 or thereabouts. While I did buy the movie trilogy on DVD when it came out around a decade ago (it’ll be a decade in May since it was released), like most compilation films of anime series, the major problem is that a lot of material is cut out and a lot of context goes with it. I know a lot of the movies were reanimated with new or altered scenes, but in my eyes I don’t think it made a lick of difference. Combined with the rather long runtimes of the films, they were quite a chore to sit through. Despite the insistence of Gundam fans, I think the TV series is a much better way to experience the original Gundam. For me I found the story a lot clearer and easier to digest in the TV series. While a number of characters such as Crowley Hamon, Ramba Ral, the Zabi family and Ryu Jose have fleeting appearances in the movies, here they are fleshed out and their motivations are clear. In particular I found Kai Shiden to be a better character here. Little time is devoted to him in the films, but here he is the almost black hearted and sarcastic antidote to the rest of the crew’s seemingly never ending stoicism. I also found Char’s actions a lot clearer here than the film versions. In short the TV series let’s all the ideas breath and develop more. Things make more sense and there’s context and reason behind a lot of what seemed rather senseless actions. One thing which seems lot in the film compilations is role many of the women play in the series. In the movies I felt that most of the action revolved around Char, Amuro and the Zabi’s. Putting aside the obvious fan favourites of Sayla Mass and Lalah Sune, many of the female characters are much stronger and much more interesting than their male counterparts. Kycilia Zabi in particular has a much larger role here and is on equal or greater footing then the male members of her family. Though she did have a key role in the films, Matilda Ajan also is much more fleshed out and seems to clearly know how to use her feminine charms to control male officers. She seems to make a greater impression on Amuro in the TV series as well. Personally I thought Amuro was a bit wimpy and a little unheroic as a main character. Perhaps that was the point, but I could never warm to him at all. And despite fandom loving Lalah Sune, like Amuro I could not see why she was so popular. I really think the audience isn’t given a chance to connect with her. She felt rather distant to me. Due to her fate, I think there should have been a stronger connection between her and Amuro. Perhaps in the original plan this was meant to happen, but due to the cancellation and subsequent reorganisation of the show’s ending, it didn’t. While I have difficulties with many of Yoshiyuki Tomino’s shows, mainly due to the rather jumbled storytelling and absurd character names, for whatever reason this show really hits the spot with me. Certainly there are a number of flaws in the show. The first is some of the inconsistent animation. There’s some really off model designs (even by late 1970's TV animation standards), both mecha and characters. Also some of the plots are bit silly. For example in one episode, the ship runs out of salt and they make a rather desperate bid to find more. The infamous 15th episode, “Cucuruz Doan's Island”, missing from all English language releases by order of Tomino himself (I did however find a copy to watch), is also pretty daft. There are also the three prepubescent children, Katz Hawin, Letz Cofan and Kikka Kitamoto, who don’t add much to the show. It’s really hard to believe they’d be allowed to stay on board. I suppose seeing as this show comes off the end of a very long line of 1970’s super robots shows, it was inevitable some of that silliness would leak into a fairly hard militaristic sci-fi show like this. The mystical qualities of the Newtypes have always thrown me a bit. I find it problematic that there doesn’t seem to be any attempt to try to explain why they have appeared or why some humans suddenly evolved to have these powers, or why there’s a large concentration of them on Side 7. The other bugbear for me what how the Zeon’s mobile suits just got bigger and uglier with each passing episode towards the end. But hey, I can live with that. It’s interesting that the colonies themselves are based upon those found in Gerard K. O'Neill’s 1976 book “The High Frontier: Human Colonies in Space”, in particular the “O'Neill cylinder” which most of the colonies in Gundam are direct copies of. How Sunrise didn’t get sued is beyond me. It’s quite amusing that this show in its English dubbed and “enhanced” format (the audio was completely replaced and some digital effected were added for its 2001 US broadcast) practically killed the franchise in the US. You just have to wonder what Bandai and Sunrise were thinks. Why didn’t they go with “Gundam X” or “Turn A Gundam” instead? We get that dopey dub from 2001, but of course the more interesting part of this release is the original audio and video. Both are stunning for material over 30 years old. The video doesn’t have a spot of dirt or a scratch on it (though cel, lighting and filming artefacts are apparent). The audio is top notch which kills that stupid baseless rumours that it was too damaged to be released that surfaced when the series was released in English on DVD a decade ago in the US sans the Japanese dialogue. The main problem here is the missing episode 15. You really have to question Tomino’s sanity sometimes. Sure it’s probably the worst episode in the series, but it’s quite rich to claim that release is a “complete collection” (as it says on the front of both sets) without it. In conclusion it’s a fantastic series that made me re-evaluate the original Gundam. I will be revisiting the movie trilogy again sometime the future because of the TV series. It’s easy to see why Japanese fandom loves the show. I was going to give it a 9, but some of the silliness dragged it down a little for me. 8.5 out of 10.